There’s no guidebook to navigating your professional life. Especially in recessionary times, your first instinct may be to catch hold of whatever job you can get. But once you get in the workplace, how do you progress, build your skills, find a mentor? As a woman, how do you balance the personal and the professional? There’s been buzz recently in the blogosphere about women not being able to have it all. If you’re just starting out, how do you achieve professional satisfaction and personal fulfillment? Levo is a growing community of professional women seeking advice, inspiration, and the tools needed to succeed. Once you get into the workplace, there’s not necessarily a set path or trajectory for where you’re headed. Having a mentor can be invaluable in helping you figure out your professional life. But, everyone is swamped with their own job responsibilities and no one has the time to–nor should they–hold your hand so you can do your own job. That’s not what a mentor is. A mentor should guide and inspire. But, how do you go about finding one? One of the most valuable aspects of Levo League is that it has built a network of mentors who are willing to share their stories and give advice based on their own experiences. And these mentors have some impressive backgrounds. Just to name a few, they include Kate White (former editor-in-chief of Cosmopolitan magazine); Sallie Krawcheck (past president of Merrill Lynch, US Trust, Smith Barney); and Sheryl Sandberg (chief operating officer of Facebook). Beyond that, Levo League also offers its “Office Hours,” a weekly video chat with business leaders from many different industries. So, you can get all this great career advice but what about actually landing a job? Levo League also features a job board so you can put all that advice into practice. 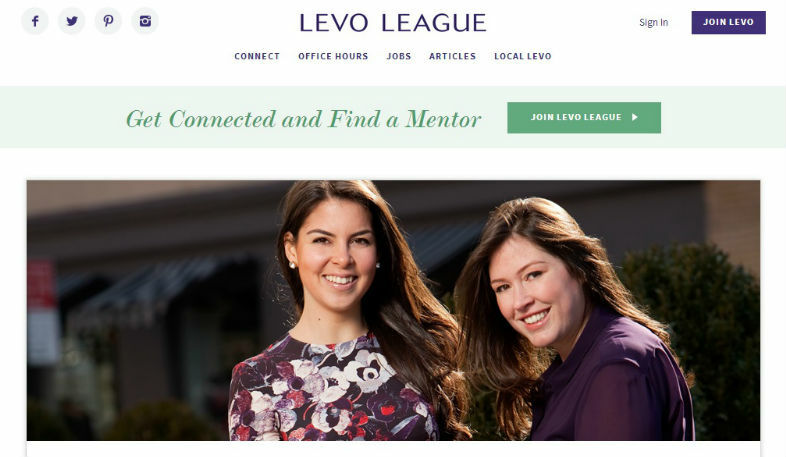 Levo League is all about educating and connecting female professionals so they can help each other succeed. With so much talk about women not being able to have it all, to “lean in,” lead, and not compromise on their skills or leadership abilities, we need the tools and the support to advance in the workplace. Levo League provides both.